Emily Parker writes: For U.S. Internet businesses, China is the land of moral defeat. Many people hoped that Western technology companies would loosen China’s control over information. Instead, those companies have willingly participated in efforts to censor citizens’ speech. Yahoo gave Chinese authorities information about democracy activists, landing them in jail. Microsoft shut down the blog of prominent media-freedom activist Michael Anti. Google censored search results that were politically sensitive in China. In 2006, those three companies came before Congress and were accused by a subcommittee chairman of “sickening collaboration” with the Chinese government. Google shut down its mainland Chinese search engine in 2010, publicly complaining about censorship and cybersecurity. For Breitbart, Tony Lee reporting: After White House officials reportedly met with big-business groups, President Barack Obama is considering executive actions that will give them more guest-worker visas in the high-tech and low-skilled sectors. This may come on top of Obama’s potential grants of amnesty and work permits to millions of illegal immigrants in the country. While outside groups are urging Obama to “go big,” Senate Democrats have expressed some concerns of late, as poll numbers have shown that executive amnesty may cost them control of the Senate. The White House is reportedly reaching out to big-business groups on guest-worker visas so they can give Obama air cover on his potential executive amnesty. For Breitbart.com, Tony Lee reports: Facebook co-founder Mark Zuckerberg‘s connections and millions could not defeat the Tea Party to pass comprehensive amnesty legislation this year. Zuckerberg’s FWD.us reportedly “surpassed its $50 million fundraising goal Zuckerberg set and has almost $25 million still squirreled away.” According to Politico, “much of the money went to media buys,” including a deceptive $150,000 ad buy in North Carolina that declared pro-amnesty Rep. Renee Ellmers (R-NC) was against amnesty to ensure that she would win her primary. But despite some small wins, the group, Politico notes, learned some “sobering lessons” of Washington. Brietbart.com’s Matthew Boyle reports: FWD.us, the pro-amnesty brainchild of Facebook billionaire Mark Zuckerberg, made a big splash at the House GOP retreat last week in Cambridge, Maryland, with a packet distributed to every lawmaker touting the benefits of a big, comprehensive reform bill. However, the Republicans who received the document might be interested to learn that one of its co-authors is a hardened Democratic party operative. According to the file properties of a near-final version of the Microsoft Word version of the document obtained by Breitbart News, FWD.us staffer Jennifer Martin was at one point the last person to modify it. Martin is a “field coordinator” at Zuckerberg’s lobbying group, according to her LinkedIn page. Jeff Sessions writes: Several prominent amnesty advocates, including Mark Zuckerberg and top Obama administration officials, have argued that amnesty is a civil right. The claim is, of course, preposterous on its face. Under this reasoning, every immigrant currently living in the U.S. on a temporary visa has the right to refuse to leave when that visa expires. And every household in a foreign country has the right to enter the U.S. illegally tomorrow and demand the Obama administration’s amnesty for “DREAMers” and their relatives. To say that amnesty is a civil right is to effectively declare to the world the right to enter the United States without permission, to bring one’s family, and to receive all of the financial benefits our nation provides. To say that one has a right to freely violate our immigration laws is to deny the very idea that a nation can establish enforceable borders. Mr. Zuckerberg’s motivation is not elusive. He heads a lobbying group representing many of his industry’s wealthiest CEOs, and their companies wish to extract generous guest-worker programs from Congress. Similar efforts are underway from other CEOs seeking new workers for everything from manufacturing to construction to restaurant jobs. Presumably, Mr. Zuckerberg believes it is more advantageous to frame the group’s lobbying as a civil-rights crusade than as a corporate crusade for lower-cost foreign labor. Happy 64th, George Orwells 1984! 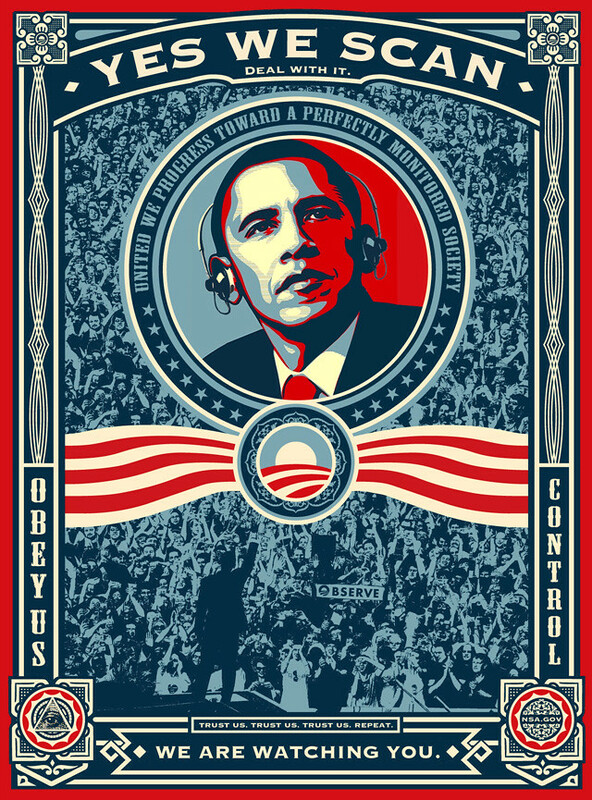 Shepard Faires Obama-Poster to fit PRISM. Ich habe heute jede Menge Sachen zum Überwachungsmonster PRISM gelesen, heute, am 64. Geburtstag von George Orwells 1984 (! ), das am 8. Juni 1949 zum ersten mal veröffentlicht wurde. Und weil ich ja heute sehr viel Zeit hatte, da dank eines größeren Ausfalls bei Host Europe die Seite down war, habe ich Shepard Fairys Obama-Poster für das Jahr 2013 aktualisiert. Ich hab’ sogar ein Allsehendes Auge an Stelle von Obey Giants Signet in die linke untere Ecke gepackt, damit das auch wirklich stimmig ist. Hier das Original zum Vergleich, hier das Baby in HighRes. Der Post hier ist ein bisschen länger und hat am Ende jede Menge Links zum Thema, da sind auch jede Menge obskure Sachen dabei, wie PRISM-Designkritik und sowas. The New York Times says you knowingly participated in the NSA’s data monitoring program. In some cases, you were asked to create ”a locked mailbox and give the government the key”, to allow it to peer into private communications and web activity. Even if the exact words of your denials were accurate, they seemed to obscure the scope of your involvement with PRISM. Outlining as clearly as possible exactly what kind of data the government could attain would have gone a long way.